I hooked up 5 Crochet Dish Pan Pin Wheel's while I was away camping. My birthmom has a trailer we head out to every summer, it's so much fun to get away from the city and unwind for a week but not without a bag of yarn! !Two days before we would be heading home I noticed that there was paper towels being used between the non-stick pans so I asked if she would like me to work something up that she could use between the pans. She asked if I would make some for her home instead but I agreed to work up some for both the trailer and her home. The trailer has a neon rainbow theme and I had the perfect yarn in my bag, some Red Heart Super Saver Day Glow. This colour looks awesome with black yarn but I didn't have enough so I made the second one with white. The three Crochet Dish Pan Pin Wheels I made for her house were made using white and grape fizz. 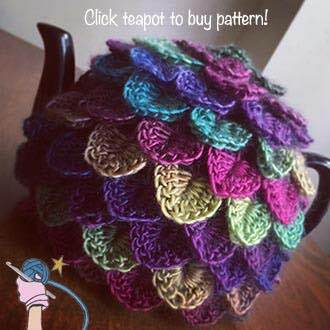 I had the pattern tested and my tester mentioned that this pattern would look awesome in a rainbow of colours, no need to stick to just two colours, the possibilities are endless especially if you have a stash of yarn scraps!! I'd love to see what colours you hook up. Crochet Dish Pan Pin Wheel Pattern Notes..
cl-st - yo, insert hook into st, yo, draw up a loop, yo, draw through 2 loops on hook, (yo, insert hook into same st, yo, draw up a loop, yo, draw through 2 loops on hook) 2 times, yo, draw through all 4 loops on hook. Notes: Fasten off yarn after each round. When starting a new round work over your ends so you can avoid having to weave them in when finished. Crochet Dish Pan Pin Wheel Video Tutorial..
Crochet Dish Pan Pin Wheel Pattern..
Have you made your own Crochet Dish Pan Pin Wheel? Please share your pictures on my Facebook WALL or 'hook up' your project on Ravelry. Happy Birthday! Mine is Sunday!